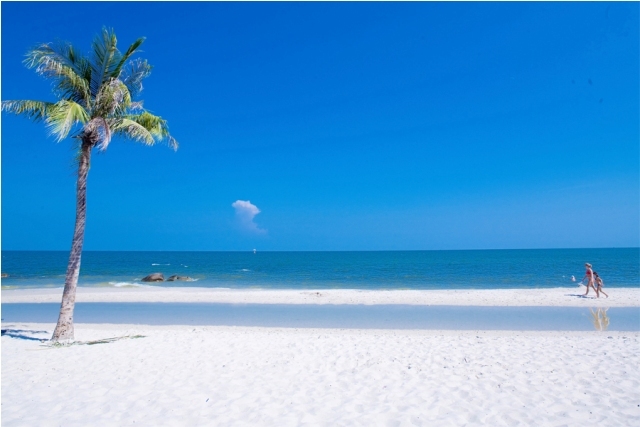 Hua Hin is the oldest beach in Thailand, and with 5 kilometers beach coast, it’s also the longest in the country. Tourists from the world over, though, do not come to Hua Hin because it was the first developed beach or that it holds a record for the longest one in Thailand. Local and foreign tourists visit Hua Hin because of its tranquil beauty and virtually unspoiled beach. Indeed, the Summer house and official residence of the King of Thailand was not named Wang Klai Kang Won or “Far From Worries” for nothing. The Hua Hin Beach offers what most beaches in Thailand could not. It offers vacationers a serene place for quiet and long reveries away from the many tourists and rowdy attractions. And it’s accessibly close from Bangkok too. Geographically, the Hua Hin is a district of the Prachuap Khiri Khan province, just about two and a half hours away from the capital city. It is located about 285 kilometers South of Bangkok and can be reached either by land or air. The name Hua Hin, which literally translates to “Head Stone”, was derived from the rock formations at some area of the beachfront. And its beach is ideal for hours of idle lounging under a beach umbrella, and the sea is perfect for water activities. Over the years, Hua Hin Beach has become so popular that, often, it gets crowded on weekends. Thai locals who want to escape the hurly-burly of the city life and who regard beach as the cure-all remedy for the constant exhaustion of city-living, spend short vacations on the beach. With Hua Hin’s proximity to Bangkok, the Thais also find it a perfect beach destination to renew and strengthen their bonds with their families, especially those with little kids. In fact, kids riding ponies along the beach is a common sight in Hua Hin. And because it’s located on the sunrise side of the Gulf of Thailand, Hua Hin is also popular with couples looking for romantic sunrise-watching getaways. Throw in the hush and lush surroundings and honeymooners have something akin to heaven. The prestige perception (because of the visiting nobilities) that is attached to Hua Hin also makes it a favorite choice for many Thai locals. These and others are just some of the reasons why Hua Hin Beach is gaining popularity among foreigners as a great place to retire in. In truth, Hua Hin is already home to many foreign retirees from Europe and America. With the stunning beach, non-touristy coast, interesting activities and excellent location, it’s not difficult to see why.